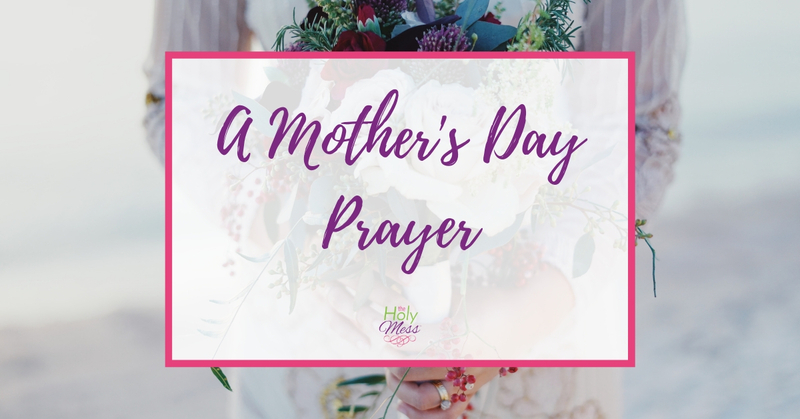 In May we celebrate Mother’s Day and this Mother’s Day prayer is the perfect way to bless the moms in your life. 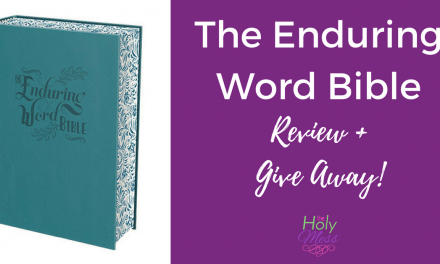 If you are a mom (like me) use this prayer to find strength and encouragement for your very important work. Today, we pray for mothers everywhere. Bless moms who are expecting a baby. Calm their fears and keep their new little life safe. Bless mothers who have babies and toddlers and are in a busy season of bottles, sippy cups, and endless laundry. Give strength to moms of little ones. They need it, Lord. Bless mothers who have busy school-aged children. Gift them with an extra measure of wisdom to answer questions, model maturity, and mold young hearts. Bless mothers who parent teens. Allow them the grace to let go when needed and the courage to provide firm boundaries when required. Bless mothers of adult children that they would savor the joy of friendship with their grown child. Bless single mothers with the strength to fulfill many roles. Provide them with supportive people in their lives. Bless moms who are married that they would care for their children by making their husbands a priority. Bless grandmothers who have the double blessing of being both mother and grandmother. May they spoil their grandkids with abandon. 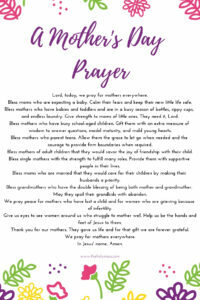 We pray peace for mothers who have lost a child and for women who are grieving because of infertility. Give us eyes to see women around us who struggle to mother well. Help us be the hands and feet of Jesus to them. Thank you for our mothers. They gave us life and for that gift we are forever grateful. 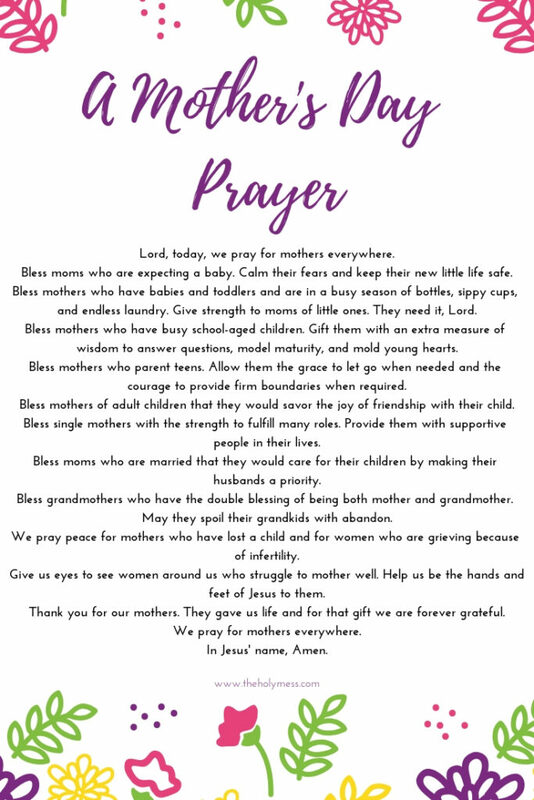 We pray for mothers everywhere. 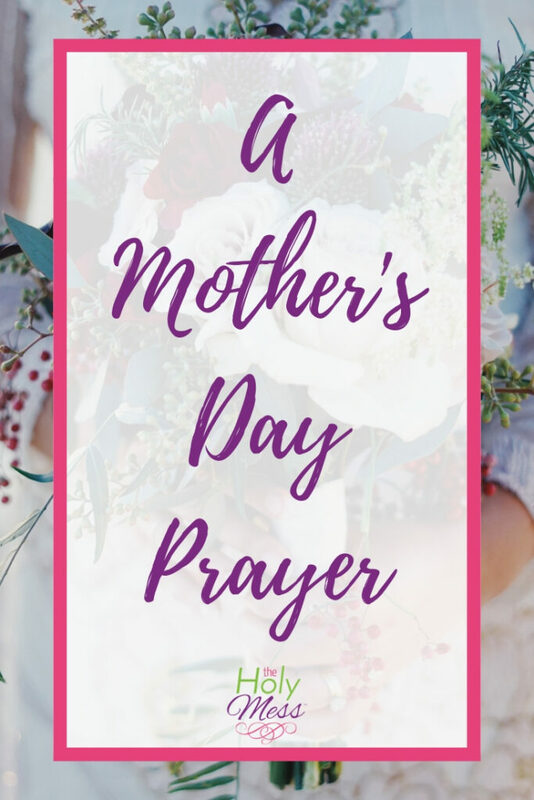 Download a copy of this Mother’s Day prayer printable for free here. 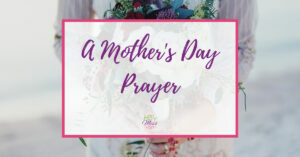 Use this Mother’s Day prayer to pray for your mom and pray for the strength of all mothers, that they will be equiped and faithful to the task of parenting their children.